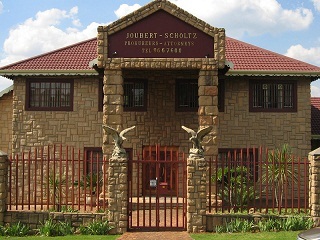 Joubert Scholtz was founded in 1986 by Mr. Jan Joubert and Mr. Evert Scholtz. Our firm has a long and very proud history, offering services to a varied range of clients, including natural persons, juristic persons, community development organisations and non-profit organisations. Our firm is renowned for fast and efficient service to all of our clients. Our core values include: Honesty, Integrity and Exceptional Service. With over 14 Attorney's and paralegal's at your service: Cobus van Staden, Christelle Lourens, Ewald de Beer, Jaco Joubert, Jandre Archer, Lizeth van Dalen, Isaiah Mashigo, Petricia Serfontein, Erwee Joubert, Chrizel Heiberg, Clint Shaw, Elsie Kwakye-Agyekum, Johande Ehlers.